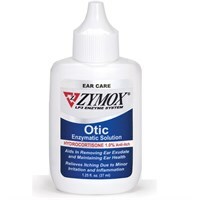 Zymox Otic with hydrocortisone is used for the treatment of acute and chronic otitis externa, an inflammation of the outer ear characterized by chronic swelling and pain in the outer part of the ears. Simply touching the ears of your pets can hurt them and can lead to aggression. Zymoc Otic is manufactured by PKB Animal Health, a well-known manufacturer of pet care and veterinary products. It provides quick relief for your pet and also eliminates the bacteria and fungi that caused the infection. It is safe to use as a long-term medication and is especially beneficial for persistent cases of otitis externa. Zymox Otic without hydrocortisone is also available, but it may not be effective for swollen or inflamed ears. Hydrocortisone can also help reduce the itchiness and redness that is often present in this type of condition. Cleaning your pet’s ears after applying Zymox Otic is important in order to remove the solution that has accumulated in the ear canal. Zymox directions: • No prior or post cleaning required • Apply liberally to fill ear canal • Gently massage, working medication into infected area • Permit pet to shake their head to remove excess • Treat once a day for 7 days for acute infections • Treat once a day for 14 days for chronic infection Active Ingredients: Lactoperoxidase system plus Lysozyme, Lactoferrin, Hydrocortisone (1%).